Do you have some jewelry or cash in the house that you wish to hide? An excellent solution is a do it yourself book safe. It is a paper craft project that is fast and super easy to make. A handmade book safe is thrifty too. Everyone has some books in their homes that are outdated, and if you don't, you can find one at a yard sale for pennies. Most of the supplies needed for a DIY book safe are items that you also probably already have on hand at home. Another plus to making this clever hiding space is that a DIY book safe is cheaper than having a wall safe installed in your home. It only takes a few hours of your time to build and gives you peace of mind knowing that your valuables are hidden and safe in your home. A book safe is a project that is also perfect for older kids! They will love the "secrecy" involved with making a book safe and have a lot of fun at the same time. Older children to have little valuables that they wish to hide from prying eyes. It is a perfect project for boys and girls ages 10 and up. Open the book to somewhere between page 50 to 100. Cover the first 50 to 100 loose pages, front cover and back cover of the book with plastic garbage or grocery bags and tape them securely in place. Measure one inch from the edge of the top page not covered with plastic and draw a rectangle cutting template with a pen and ruler. Apply Modpodge or white glue liberally with a paintbrush to the outside edges of the book. Allow the book to dry. This step is optional. If you wish to have sharp inside corners, use a drill with a medium size bit and drill a hole on each of the four corners of the template.The holes will help when cutting corners with the utility knife. Be careful not to drill through the back cover. Use a metal ruler and utility knife to trim the inside of the book. Take your time when cutting out the inner portions of the book. The more your rush, the better the chances of having ragged edges. Remove the cut squares from the center of the book and discard. Continue cutting out the center of the book until you have a square hole as in the photo above. A quick tip* Always remember to use common sense with cutting with a utility knife.Make sure to protect your fingers and hand to avoid injury. 10. Apply Mod Podge or glue liberally with a paintbrush to the inside pages and cut edges of the book. 11. The bottom portion of the book will be glued together and form a box type structure. 12. Place a sheet of wax paper over the glued portion of the book. 13. Close the book shut and put something heavy on the book to weigh it down. *Optional You may line the inside of the book with extra paper as in the photo above or if you wish to add a bit of elegance and line the center hole with black felt. 15. 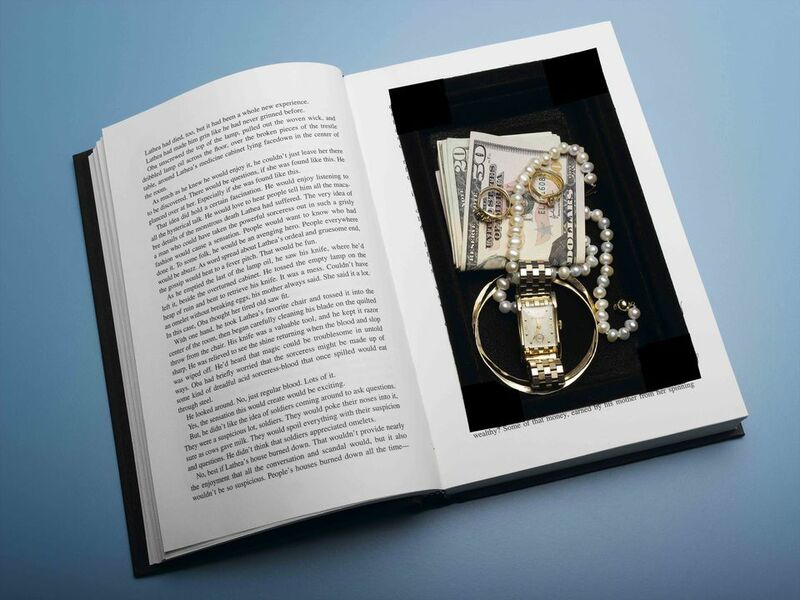 When the book is totally dry, you will be able to use it as a place to hide your valuables. 16. Put the book on a bookshelf in between other books and no one will ever guess that you have hidden valuable objects on your shelf.Love it!